Nominated for the WordPress Family Award! 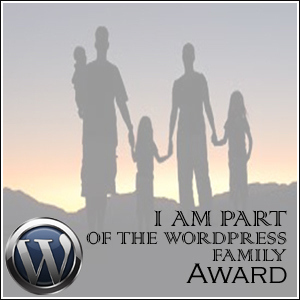 I am so honoured to receive this WordPress Family Award from not one blogger but two!! How blessed can I be? Thank you dear Jane @ http://johannisthinking.com and Shaun @ http://prayingforoneday.wordpress.com/ Both Jane and |Shaun are great bloggers, and their follower figures reflect it. Jane has 375 followers and Shaun 696……I think the reason why they have such great stats is because they care!! They comment, email, care and share. Their blogs are filled with real-world life, happiness, sadness, pain, compassion and laughter… They share their joys and sorrows. So this award is about being part of the Word press Family! I started blogging almost a year ago. It was just after my BFF and Dad’s one year anniversary and Vic had made the decision to let nature take its course. It was a difficult time for the family. We were helplessly watching Vic die – little by little every day. Her pain was unbearable. My blog started off cautiously focussing on Vic’s pain. Tracy @ http://ohwhatapain.wordpress.com/ opened my eyes Vic’s pain – I could “feel” Vic’s pain after I met Tracy; Katie Mitchell @http://connectivetissuedisorders.wordpress.com/ – an incredibly brave young woman who encouraged me when she is in so much pain of her own… I could “see” life through an ill person’s eyes…”feel” her pain through the eyes and words of other Chronic Pain Sufferers. I grew more comfortable sharing and started blogging more about my fears and emotions… Ultimately about Vic’s death and our grief as a family. I love my blogging family! Love you guys. I know there are slightly more than 10 nominations. I PRAY I did not omit a precious friend’s blog. If I did, please do not be offended. Blame it on the flu. Thank you to all my friends and followers for their support, comments and awesome posts! Posted on May 7, 2013 Categories Awards, Family, Vicky BruceTags Blog, Family, http://behindthemaskofabuse.com, http://grannyscolorful.wordpress.com, http://hopethebean.wordpress.com, http://janevanwyk.wordpress.com/, http://jmgoyder.com, http://johannisthinking.com, http://justiceforraymond.wordpress.com, http://maryrussell12.wordpress.com/, http://myjourneysinsight.com/, http://mymomsmemoirs.wordpress.com, http://myownheart.me, http://prayingforoneday.wordpress.com, http://talktodiana.wordpress.com/, http://valeriedavies.com, Jane, Katie Mitchell, Shaun, The Rules, Vic, WordPress, WordPress Family Award20 Comments on Nominated for the WordPress Family Award! I would like to thank two of my dear blogger friends for this amazing award. 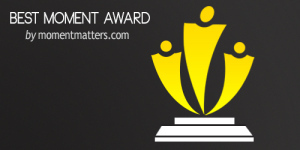 I dedicate this award to my precious child who is the reason and inspiration behind my blog. I started my blog when Vic was going mad with pain, and I was still fighting the system to get her into a Hospice Program. Shaun has more than 670 followers after only blogging for a couple of months…He is articulate, bright, honest, sensitive and an amazing friend and blogger. I have so much respect for this young man who has overcome so much tragedy and hardship in his life. His love for Dawn and his children radiates from his blog. The second is Wisconsin native Jane Johann, is a retired Reading Specialist and Language Arts Teacher. Jane received her undergraduate degree from Marquette University, where she earned a B.A., majoring in English Literature and a minor in Secondary Education (1974). She attained her M.A. as a Specialist in the Acquisition of Language and Reading Instruction, K-12, graduate of Cardinal Stritch University (1994). Shaun and Jane thank you for honouring me with this wonderful award. I humbly accept. Wendie Jeanne Deacon at http://deaconfamilyblog.wordpress.com/an-angel-named-vic/. Wendie is a new blogger. I actually don’t know how she found my blog but I am grateful that she did. Wendie has fallen under Vic’s spell! Wendie is a very, very brave young woman. I cannot share her bravery and determination with you because she shared it with me in private correspondence. Wendie you are great. Thank you for your tribute to Vic and your friendship! I hope that you will blog about your challenges so the world can learn from you. Lori at http://letstalkaboutfamily.wordpress.com/ was her late Mom’s advocate and caregiver. Her beloved father suffers from Alzheimer’s and Lori suffers from debilitating back problems. Lori is caring and understands the stresses of caregiving. Lori blogs about elder care, death and dying, assisted living, family relationships, hoarders and hoarding. She is an excellent blogger. Gloria at http://grannyscolorful.wordpress.com is an amazing friend. Gloria always leaves a word of encouragement after reading my posts. She writes about her sadness after her son’s death, her anger, depression and the rare happy day. Gloria is a very colourful blogger and I encourage you to visit her blog. Emmitt Owen Riley at http://mysteryoriley.com/dear-grieving-parents/ is a blog that gives one a glimpse of how these parents are coping with their journey of unbelievable grief, loss, and mystery after the mysterious death of their 20-year-old son. Truly a brave blog. Mel Lefebvre at http://hopethebean.wordpress.com is blogging her pregnancy. She lost her precious baby, Henry, to Osteogenesis Imperfecta. It is the genetic disorder that my precious Vic was born with. This blog is about hope, fear, more hope and love. Please hold Mel in your prayers. Love you Mel!! Diana at http://talktodiana.wordpress.com/ ‘s blog is a wonderfully upbeat blog. I love the quote section! “Never stand begging for that which you have the power to earn.” – Miguel de Cervantes is just one of many! Great fun. Thank you Diana for featuring Vic’s journey (and my blog)on http://talktodiana.wordpress.com/2013/04/12/friday-pick-46/ . It meant so much to me!!! Jane at http://janevanwyk.wordpress.com/ blogs about her daughter DD and her daughter’s illness. 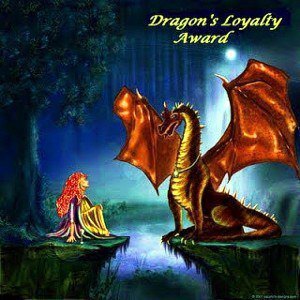 She is a brand new blogger and I am giving her this award to encourage her to come back and continue blogging. Kelly at http://nevercryoverspilledmilk.com is a single mom who bravely battles chronic pain. She makes the brave statement “you can’t cry over the small things and you have to look at the big picture.” Kelly you are a brave young woman. Victoria Bruce at http://furrynuff.wordpress.com/ is a fellow South African blogger with my Vic’s names…I love commenting on her excellent posts because I get to type “Victoria Bruce”….She also happens to be a great blogger. I hope you accept this award Victoria Bruce. Jonathan at http://afathershope.com/ eloquently writes about his grief when his baby daughter was born without kidneys. Jonathan writes from a father’s perspective. He admits to his raw pain and shares how he copes with his grief. It is a blog of hope. Denise at http://forphilip.wordpress.com/ blogs about her raw, undiluted pain after the death of her son, Phillip. It is a difficult blog because she so perfectly articulates my pain, anger and longing. Diane I hope you will accept this award. http://behindthemaskofabuse.com is a heart wrenching blog about a woman’s life of abuse. She was raised by a narcissistic father, and a mother who rarely protected her from his verbal, mental , emotional and psychological abuse. She endured molestation, both inside and outside the family setting, raped at the tender age of 11 years old. This blog is written by an amazing person. A strong person battling recovery, anger and betrayal. She battles C-PTSD and BDD. Out of her pain two books were born and are published on Amazon “Buckwheatsrisk-Abuse Survival”, and a poetry book entitled “If I Could Write my Heart” I salute you! Alison at http://happilyhomeless2.wordpress.com ‘s Handsome Husband died on the 21st of April from cancer. She is going through a dreadful time. She is angry, very angry… Alison I don’t expect you to do anything with this award but I am nominating you so you can know I am thinking of you. Hugs of strength to you. Optie at http://walking-on-eggshells.com is another fellow South African whose blog I enjoy for her humour. Optie has however also been an amazing friend – always leaving a little message of encouragement. Thank you Optie. Winners have the privilege of awarding the next awardees! The re-post should include a NEW list of people, blogs worthy of the award, and winners. Notify them the great news.